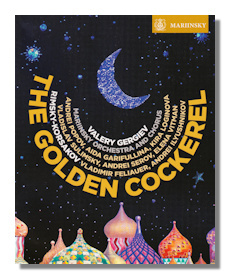 We should expect a performance at the Mariinsky by its general director and artistic director, Valery Gergiev, with the St. Petersburg Mariinsky Theater Orchestra, Chorus and soloists of Rimsky-Korsakov's final last and possibly most intriguing opera, Le coq d'or (The Golden Cockerel) to be excellent. And so this latest release on the Mariinsky's own label – available in Blu-Ray and DVD formats – truly is. The Golden Cockerel is an opera in three acts, with short prologue and epilogue. It has an apparent simplicity about it (as does a fairy tale, which genre Rimsky consciously hinted at). It can be read on several levels. Rimsky was sure, though, that the elements of the story which criticize power and the abuse of power were worthy subjects. The great strength of this production is that it forces no one period or way of interpreting the consequences of lust and weakness with which Le coq d'or deals. It's not, though, a "neutral" or insipid production relying on hazy symbolism or stereotype. It was finished in 1907. But because it portrays a flawed Tsar, it wasn't performed during the composer's lifetime. Based on a story by Pushkin (itself based on two chapters of Washington Irving's "Tales of the Alhambra"), the libretto is by Vladimir Belsky. The Cockerel (Kira Loginova, soprano) is introduced by the Astrologer (tenor Andrei Popov) to the court of King Dodon (Vladimir Feliauer, bass baritone) in order to crow warnings of potential attacks on his mythical kingdom. Dodon has lost his taste for war and rewards the Astrologer with a single wish, which he only uses some time later. He asks for the Queen of Shemakha (soprano Aida Garifullina) who has seduced the king after his unwarlike sons have died in battle, for himself. Outraged, Dodon kills the Astrologer but is in turn pecked to death by the Cockerel, who finally leaves with the Queen, the court in chaos. In the epilogue, though, the Astrologer returns to explain that all the characters we have just seen as unreal, imaginary – except… for himself and the Queen. This production of The Golden Cockerel is a lively one. It uses both computer-generated graphics and real action, as designed by playwright, script-writer, film director and producer, Anna Matison – her first such collaboration with the Mariinsky, where she also worked as production and costume designer. What one notices in this production above all is the way in which Rimsky-Korsakov drew so strongly on the rich tradition of the fairy- and folk-tale in Russia. At the same time, the qualities of The Golden Cockerel as adult parable have not only been preserved, but accentuated. Indeed, the composer was very specific about how exactly the components of his work should be made to comply with his score; and how little latitude subsequent performances should be allowed to make it their own… no cuts, no (unscripted) interjections, strict observance of tempo markings etc. Also that the Cockerel herself should be a strong soprano (or mezzo): that certainly applies to the exuberant yet totally contained and controlled Kira Loginova here. Just as it does to Aida Garifullina, though in a more fluid way. What's more, the presentation of the performance visually reflects the delicate balance between the surreal and the magical at the start with the colors, sparkle and fonts used for the DVD's titles. Then, even though we are introduced to the theatrical experience with the now almost obligatory short sequences of the audience taking their seats and children agog at the spectacle they're about to be entranced by, the lighting retains that air of magic throughout. Although the modernization of Rimsky's carefully-worked world with iPhones and decidedly modern dress may still jar. Surprisingly, perhaps, for a large-scale production such as this, there is a sweetness and gentleness to the Mariinsky Theater Orchestra's playing… woodwinds and strings alike suggest both the sensitivity and intimacy which Cockerel and Astrologer need in order to achieve what they do. At the same time, when things get tough, both the orchestra and Chorus, as well as the principals, push the action – and the necessary emotion – forward with neither fuss nor histrionics. They make what happens seem natural, and even inevitable. Gergiev has a supreme understanding of the idiom of the origins of Rimsky's plot as well as the way in which the musical ideas are realized in the interests of a truly operatic drama. Crowds comment and add to – rather than merely supplement – the action. Just the right amount of detachment is achieved for the characters to be credible, without our ever feeling we should be more drawn into their lives than would really make sense. Nor do their interactions one with another or their expositions risk becoming merely "representative" or falsely archetypal. This uniform yet not monolithic presentation of the story, whose "moral" seems hard to understand in full at first, is aided significantly by the principals Loginova (the Cockerel), Popov (the Astrologer) and Feliauer (King Dodon) are particularly noteworthy. Their singing penetrates, yet does not alarm. And their acting retains just the right blend of apparent amazement at yet determination to respond to what is happening to them as a result of their actions. Some may feel that the amalgamation of crisply/cleanly quasi-modern and symbolically latter-day Tsarist costume doesn't completely work. But, if so, the committed and engaging singing more than makes up for this. Gregiev and his singers in particular, supported by the Mariinsky forces on superb form, have produced a rendering of an opera that's hard to stage. One can interpret those areas of Rimsky's conception which are (deliberately) ambiguous in many ways, given the political and historical context in which it originated and on which it subversively commented. Perhaps the worst thing one can do is avoid the issue and keep its staging (and even those chosen to take the key roles) purposefully ambiguous. The best is to understand the scope of that ambiguity and carry every aspect of it through the production from scenery to vocal delivery. Then the sense with which the audience is left is most effective. This is exactly what this production does. And what its accomplished soloists do without seeming to be aware that they have met such a challenge. The acoustic is bold and supportive, even given the close and prominent miking used for this video; this closeness is sometimes even to the detriment of the full orchestral sound – though not its clarity. The booklet is minimal and contains only a synopsis of the opera and brief bios. There are two other DVD/Blu-Ray versions of Rimsky's The Golden Cockerel – on Arthaus (108053) with Kent Nagano and Video Artists International (4518) under Aram Katanian. Yes, it's an opera with a strong visual appeal. In this production the use of color, and of objects as well as speed of movement all actively support the underlying sense which Rimsky wanted to convey of the tenuous relationship between illusion and reality. It also respects the composer's directives to emphasize the sensual. Add to this crisp, trenchant and thoughtful singing and playing and you do indeed have a performance (intelligently captured) which will satisfy at first listening/watching; but also continue to intrigue thereafter.